Téllez Solà, Antonio. The Unsung Struggle : Resistance to Franco 1939-1951 . Kate Sharpley Library: 1992. 35 pages. Translated by Paul Sharkey. 9781873605202 Not currently available. Find at a local library. Alberola, Octavio and Ariane Gransac Sadori. Spain 1962 : The Third Wave of the Struggle Against Franco . Christie, Stuart, Albert Meltzer and Antonio Téllez Solà. 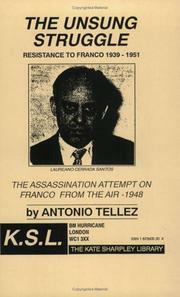 The Assassination Attempt On Franco From The Air, 1948 . Aguayo Morán, Mariano, Freddy Gomez and Antonio Téllez Solà. Los Maños : the lads from Aragon ; the story of an anti-Franco action group .